A 21-story rocket lit up the Florida night sky Wednesday morning, delivering an Air Force satellite to orbit. 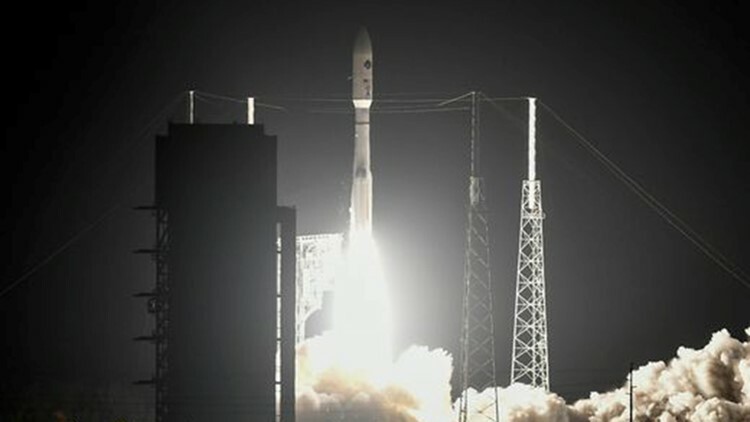 A nearly $2 billion Air Force satellite designed to keep the president and top military commanders connected even during a nuclear conflict blasted off early Wednesday from Cape Canaveral, riding United Launch Alliance’s most powerful Atlas V rocket. Leaping from Launch Complex 41 at 12:15 a.m. with a window-rattling 2.5 million pounds of thrust, the 21-story rocket lit up a clear night sky and streaked eastward over the Atlantic Ocean. The Air Force’s fourth Advanced Extremely High Frequency satellite, or AEHF-4, was deployed three-and-a-half hours later, on its way to an orbit more than 22,000 miles above the equator. The Lockheed Martin-built spacecraft will add to the military’s most secure satellite communications network, which uses radio frequencies able to operate in radiation that would stymie signals from most communications satellites. “On a really bad day, you really want to have this system in place,” said Mike Cacheiro, Lockheed Martin’s vice president of Protected Communications. The constellation’s fourth satellite will make it possible to beam data at rates 10 times faster than is possible with the Air Force’s legacy constellation of five Milstar satellites dating to the 1990s. However, many ground terminals aren’t yet compatible with the higher data speeds, which may not be achieved before 2020.